What are the chances of 3 perfect games occuring in one season? Perfect games are pretty rare. Before this season, only 18 had ever occurred. But what are the chances that 3 would occur in the same season? Prior to this season, there were 391,218 MLB games played (via Baseball Reference). With only 18 perfect performances, that means that any particular game has a 0.005% chance of being a perfect game. 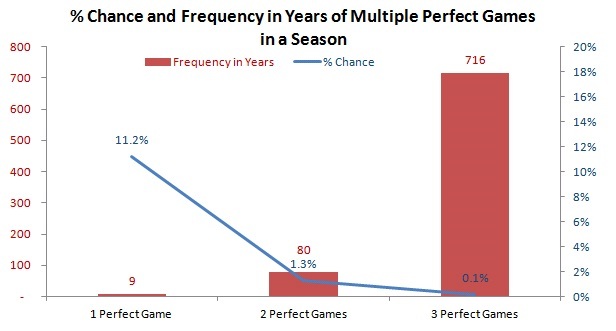 Multiply that across 30 teams playing 162 games in a season, and there’s an 11.2% chance that a perfect game will occur in a season (approximately once every 9 years). For 3 in one season, the odds decrease to 0.1% chance (once every 716 years). So, 3 perfect games in 1 year would be a remarkable thing, occurring approximately once per millennium. But 2 in 1 year – not that big of a deal. Since it should happen about once every 80 years, that fact that we it hasn’t happened until now means that we were due. Let’s dig in a little deeper. What about these events occurring in one month. Is that any more special? Yes. 2 perfect games in a month hasn’t happened until now. Statistics suggest it’s pretty rare as well, occurring once every 480 years. As for 3 perfect games in one month, the odds are astronomical: 1 in 25,759 years. Note: the % chance in the monthly view is for any particular month. i.e. 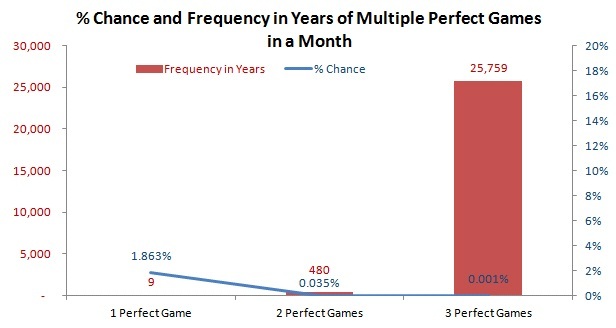 in any particular month, there is a 1.863% chance that a perfect game will be thrown in that month. However, the expected frequency in years is on an annual basis – because there are 6 months of baseball a year, expectedly, the number of years is the same as on a seasonal basis for 1 perfect game.